At the Chicago Century of Progress Exhibition (1933-1934), Ford displayed a concept vehicle called the Briggs Dream Car, a rear-engine car with unitized body designed by John Tjaarda of Briggs Manufacturing Company, Ford's major body supplier. Tjaarda based his design on aero- dynamic monocoque designs and models he began working on in 1926, called the Sterkenberg Series, which he refined in 1930 while working for Harley Earl. In 1932, he was hired by Briggs as chief of body design in their new in-house design center. Briggs had just bought out LeBaron, Inc., and became Detroit's largest independent body producer. John Tjaarda (say "charda"), 1897- 1962, was born in Holland of a titled family in the Sterkenberg area. He trained in aeronautical design in England and served as a Dutch Air Force pilot before emigrating to US in 1923. He worked first on custom bodies in Holly- wood, then pioneered in monocoque streamlined designs while working for Duesenberg and Harley Earl. Tjaarda and others were inspired toward aerodynamic car design by initial work started in 1921 by Austro-Hungarian engineer Paul Jaray, who began testing car models in aircraft wind tunnels. Jaray later used this data to design the streamlined 1933 Tatra 77 built in Czechoslovakia, which remained in production into the 1990s. 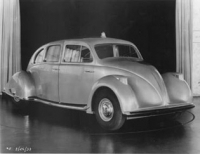 The Tjaarda Dream Car bore an uncanny resemblence to the 1932 inexpensive rear-engine small car developed in Germany by Dr. Ferdinand Porsche for the NSU Company called the Type 32, or Kleinauto, which in 1933 was already on its way to becoming the Volkswagen Beetle. On the other hand, Porsche's design owes a lot to Tjaarda's Sterkenberg Series of the late 1920s. Chrysler picked up on aerodynamic research in 1927, prototyping a design in 1932 which resulted in their infamous Airflow design of 1934. Ford, in 1933, had begun annual styling changes (pioneered by Chevrolet in 1928 and causing the demise of Ford's Model T). Ford authorized development of the Briggs Dream Car to fill its need for a "small" Lincoln, and indeed, the design was patented in 1935 and became the prototype for the 1936 Lincoln Zephyr. The Zephyr was designed by John Tjaarda and Howard Bonbright, both of the Briggs Manufacturing Company, for Ford, under the supervision of Henry's son, Edsel, and Eugene T. (Bob) Gregorie (b. 1908), head of Ford's first internal styling department (which was initiated by Edsel in 1935). The Zephyr, however, looked quite different from the 1933 Dream Car because its engine was moved to the front and a "prow" added by Gregorie. The Museum of Modern Art later called the Zephyr the first success- ful "streamlined" car in the US. PS: John Tjaarda's son Tom (b.1934) re-located to Italy in 1959, where he worked as a car designer at Ghia, designing the DeTomaso Pantera and the Ford Fiesta (1977), and later at Pininfarina. He established his own small automotive design office, Dimensione Design, in 1984.